DANNY DEVITO voices The Lorax in "Dr. Seuss' The Lorax." ©Universal Studios. (Click on photo for hi-res version). 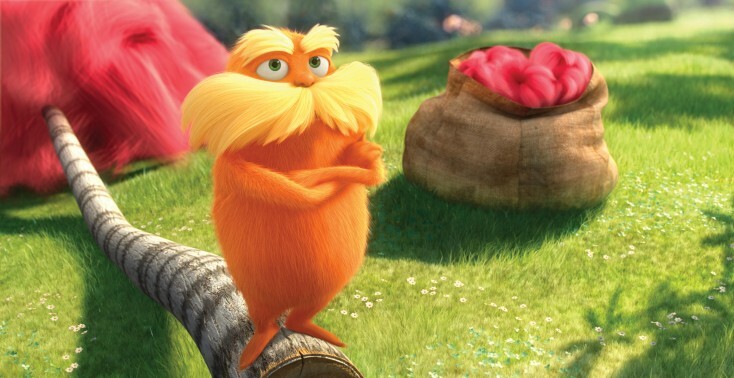 Adapted from Theodore Geisel’s children’s book, “The Lorax,” which is being shown in 3-D in some theaters, delivers a message that unless we take care of our natural resources, we will destroy them. As the Lorax, he appears to the Once-ler, an entrepreneur who cuts down the beautiful Truffula trees to make them into Thneeds, warning him of the severe consequences. The Once-ler ignores the Lorax, and gets very rich making his must-have goods. Soon he destroys every last tree, and his business is gone. If only he’d listened to the Lorax. Hope remains with one remaining Truffula seed, which the now-sorry Once-ler puts in the hands of a 12-year-old boy, hoping to deliver a Truffula tree to a girl he likes. DeVito is operating on fumes as he arrives for an interview on a Universal Studios sound stage, having just flown in from Indianapolis, where the day before he watched his beloved New York Giants defeat the New England Patriots, 21-17 at the Super Bowl, then enjoyed in a post-game party until the wee hours. The star of FX’s “It’s Always Sunny in Philadelphia” says he couldn’t be happier about the Giants’ win. He also is excited about the release of “Dr. Seuss’ The Lorax,” in which he co-stars with Ed Helms, Zac Efron, Taylor Swift and Betty White. Front Row Features: You just saw a screening of the movie. What did you think of it? Danny DeVito: It’s fantastic. I was so excited to see it. They did such a great job in 3-D. I’d been seeing little scenes in different languages. It knocked me out how rich and beautiful it looked when they were going down the streets and I saw the trees and the fact that the characters were true to the people who played the parts; with Taylor, Zac, Betty and Ed, everything was falling into place. I felt very happy about that because I set out to speak to not only the kids in the audience and their parents but I wanted my fans who know me from TV and other movies to (enjoy it). Front Row Features: You recorded the voice of the Lorax not only in English, but in other languages as well, for other countries. Why? DeVito: I had been looking at the film in Spanish, Italian, German and Russian and I dubbed my voice in all those languages. This is the thing, I don’t speak any of those languages. I speak a little bit of Italian, but I did it all with coaches and phonetically. It was a lot of work. It was something that once you cop to it and decide to do it, the water is really cold when you get in. “Oh my God, that mountain is high.” You’re at the plateau and you say, “Okay we can rest here”. You look over and there’s the top of the mountain and you go “Okay, we did German and Italian and there’s Russian.” But we had a great time. Front Row Features: Did you just go it all while at the mic, saying the lines in each language? DeVito: Oh no, we did the whole thing in Spanish and Castilian; Spain and Mexico are too different things. I did both. There are about 40 words in Spain that are different but they don’t say Thneed. They say something else for that. I would tackle one (language) at a time. (The producers) brought in people from each country so I had two Italians with me, one on either side who spoke English and Italian and a technician in the back working. Sometimes the lines were very long so there was no way for me, in German or Russian to get through that entire line without messing up some intonation and I really wanted to capture the performance and I didn’t want people to think I had an accent. Front Row Features: So are you getting angry letters from other voice-over actors because you took their jobs? DeVito: (He laughs.) No. I did some Russian interviews on the phone and I said, “I know you guys have great actors to do this”. It was just one of those things where I got it in my head to do it and once I said I would do it, I didn’t want to back down. It’s a fun thing but time consuming. I thought I’d do German in a couple of days. Right. It took more like a week. Front Row Features: The Lorax evidently lives in a tree stump. DeVito: I thought that was cool when he came out of the stump. That was really fun. At first, when I read the script, I thought he was a guy who lives in the forest, and he does, but he’s magical and comes out of a tree stump with all the lightning and thunder. That’s big. Front Row Features: Did you notice any of the animated Lorax’s movements that reminded you of yourself? DeVito: Yeah. I’ll say something and make a move or do a gesture and that was all in there. The other stuff I found surprising was the sweetness kind of worked out too. I felt that the Lorax had a sweetness about him. Front Row Features: What are your thoughts on the strong green message in the film, and what do you hope people will take away from seeing the film? DeVito: It gave that message and offered it to folks. It wasn’t like beating them over the head. It was a really nice presentation of that. The only thing the Once-ler did wrong besides get greedy with the Thneeds is that he didn’t provide for the Earth in any other way. That’s when Ted, the Zac Efron character, comes to him, and he redeems himself because he saves the (last) seed. That’s a message we can all take away. It’s not saying we can’t be inventive and still think of things to sell or make or manufacture, but the idea is that if we’re going to take the goods from the Earth, the supplies, the materials from anywhere, we should think about the sustainability of it, the replenishing of it. That’s why the focus goes to “Unless”, as Dr. Seuss said, “unless someone like you,” meaning everybody out there (helps). Front Row Features: This movie also warns against the negative results of corporate greed. DeVito: Yeah we humans operate most of the time on greed and fear. Somebody will scare the hell out of us and, most of the time, we’ll follow them anywhere. We’ve all experienced that where we blindly follow our leaders. We have to be aware and sensible and all get involved and make sure we are calling people on stuff. We have to clean up our messes. Front Row Features: In what way are you green? Front Row Features: Anything else? DeVito: Last month I bought a (all-electric Nissan) Leaf. I don’t have any cars that are gas-guzzlers in my family now. We had the (hybrid Toyota) Prius, which is a really good car. There’s a Chevy Volt out that has a 40-mile range on electricity, and the rest you can travel on gas. I wanted to go all electric, so I got rid of the cars. We still do have a Prius—my daughter has a Prius—but I drive the Leaf, and it’s a fantastic car. You get at least 80 miles of charge. I just did a movie downtown. I drove it down there and put it in the parking lot and had plenty of juice left. I’m just hoping everybody goes out and explores the possibility of getting a car with zero emissions because it’s a great thing.